"At 5:44 p.m. EDT, Environment Canada meteorologists are tracking a severe thunderstorm capable of producing very strong wind gusts, up to nickel size hail and heavy rain. A thunderstorm just west of Dunrobin will reach the Kanata area near 6.00 PM then the downtown Ottawa and Gatineau areas around 6.30 PM. Wind gusts of 90 km/h and 2 to 3 cm hail are possible with this thunderstorm." The temperature has dropped to 24C/75F, the wind is whipping up the trees and quite a number of leaves have fallen and littered the lawn and we are promised a thunderstorm, then up to 30C for the rest of the week. In spite of the bear killings the other day, the little brown bear that looks so sad has been around again, so I am reluctant to be out in the garden. I don't know if he eats strawberries, but my second bed that produced a couple of pounds the other day has been flattened, I cannot think of anything else that would have done that. My lettuce has also been chomped up. I think next year I will be building cages to cover my beds. The storm hit with very heavy rain but thankfully there was no hail. @Kelejan wrote: The temperature has dropped to 24C/75F, the wind is whipping up the trees and quite a number of leaves have fallen and littered the lawn and we are promised a thunderstorm, then up to 30C for the rest of the week. Yes, I think that will be necessary. The countdown is on to Canada 150. July 1st is Canada Day and this year we will be celebrating Canada's 150th birthday. It's going to be crazy here in the Capital. TD - I think, no better place to be than in Ottawa for Canada Day. I heard U2 was going to be there. Back to gardening... I picked my first carrot last evening. I knew they weren't really ready yet, but I'm not so patient sometimes, and I wanted to see what they looked like. I should have taken a photo, but my son and I ate it. It was kind of wonky shaped, but still a good 6" long and tasted great. Also, my snap peas are just on the early edge of ripe. I'll give them until tomorrow and then pick them to eat when we're up at the cottage this weekend. My dog seems to have taken a liking to these as well. Good job it's fenced off! Good going, Jaffa. New carrots always taste so good as do new potatoes. Jaffa, nice! 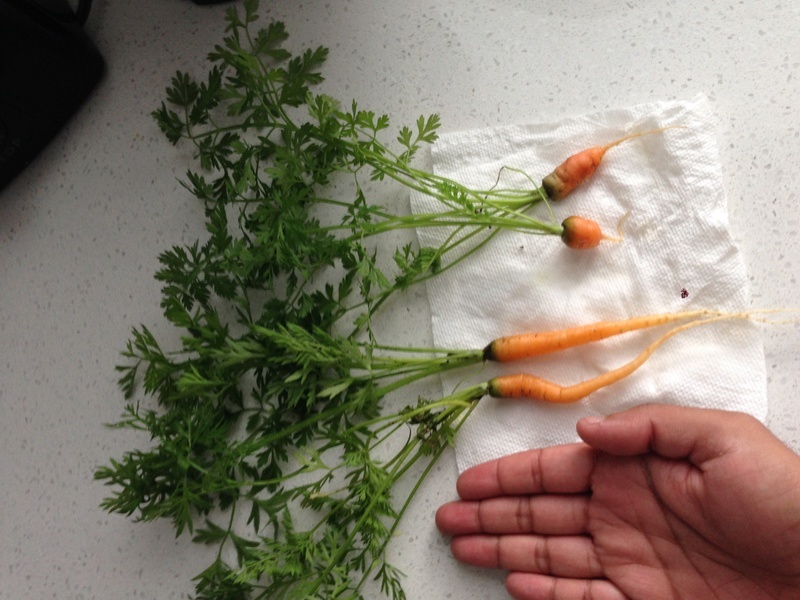 Probably way bigger than the two carrots I picked today. I'm just as impatient, haha. Although it has been more than 2 months and these are supposed to be mini carrots, according to the seed package. Posted this in the carrot week thread also. The teeny tiny ones are Romeo baby carrots growing in a container, leftover ones from the same batch I posted last time. They didn't do that great being started indoors I guess! Kelejan, sorry to hear about the bear issues. :-( Fortunately, out here we mainly deal with raccoons, although some of the city raccoons downtown often are bear-sized. Well, maybe bear cub sized, lol. One advantage of gardening on a terrace, although space is limited, no wild animals to deal with. I'm in the burbs so I often hear people have issues with deer around here, also. TD, I share your frustration. The constant rain and severe weather is getting a bit ridiculous now. No end in sight! Bring on July. 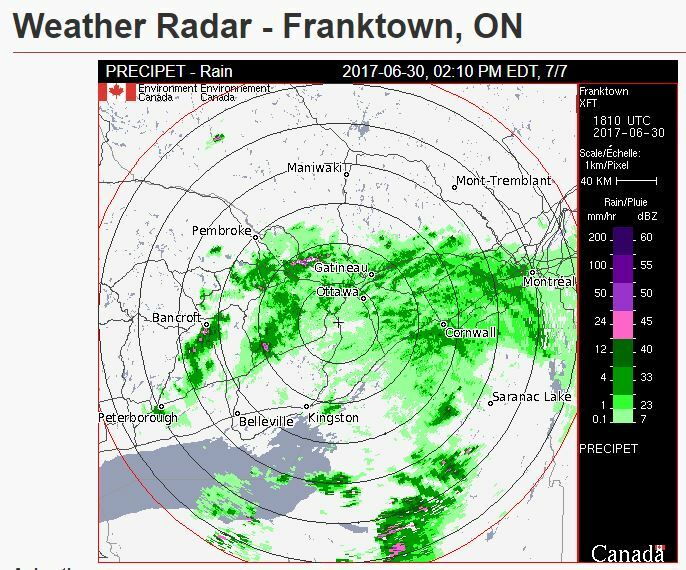 This is what the current weather radar looks like for my area. TD, you are right in the thick of it with no way out. PLEASE SEND IT TO THE MARITIMES!!!! It's been strangely dry here. The sky keeps threatening storms, but only delivering 5 minute sprinkles. Best I can do from here. Hopefully, you will get that rain soon. @sanderson wrote: Best I can do from here. Hopefully, you will get that rain soon. Much appreciated. I got some nice rain in yesterday - even if it did come at the cost of losing power for part of the night. The skies are still cloudy, so there is hope that I may get more rain today.